What family doesn't love popcorn with their family night movies? Or how about at school parties, birthday parties or at the movies? Our family is NO exception. We love popcorn as a snack. When time allows, we prefer to pop our own and add a sprinkle of salt and dairy-free margarine. I have found over the years that if you aren't dealing with milk allergies, one often doesn't think about the fact that BUTTER does contain MILK. For this reason, our family can't usually eat pre-packaged popcorn. The following is one of our favorite quick options. 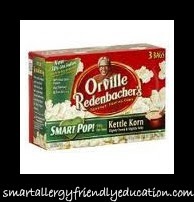 Orville Redenbacher's SMART POP, 94% FAT FREE, KETTLE KORN, distributed by ConAgra, Foods, Inc. Ingredients include: Popping corn, palm oil, less than 2% of: salt, potassium chloride, sucralose, tbhq and citric acid(for freshness). It also states on the packaging that there are NO ADDED DIACETYL BUTTER FLAVORINGS and that contents are 100% WHOLE GRAIN. For more information, contact: http://www.orville.com/ or 1-800-243-0303. This sweet and salty popcorn is available in a box of 3 - 2.9 oz. bags or in 4 Mini-bags for individual snacking. The mini-bags are ideal for taking to the movies, prepopped, of course. Leave a couple of bags at school for those surprise parties or send them with your kids to their playdates! It's a great treat for everyone.